Learn questioning methods to improve students’ comprehension and critical thinking. Space is limited, so reserve your webinar seat now! After registering, you will receive an invoice. You will find your unique webinar URL and passcode on this invoice. On the date and time of your webinar this information will be required to join the webinar. Upcoming Webinars: Helping students think about what they read. Please join us for an interactive webinar experience. Review the essential elements of a Shared Inquiry™ discussion or take your knowledge of the Shared Inquiry method a step further! Choose from three great options below. 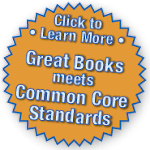 This course provides participants with a review of the essential elements of a Shared Inquiry™ discussion and the Great Books interpretive reading activities, that enable students at all levels to participate successfully. Teachers will solidify their understanding of their role as leader and how Shared Inquiry connects to state and district standards. This intermediate-level course will help you increase the impact of Shared Inquiry on students’ reading comprehension by integrating reading strategies such as rereading, making inferences, and asking questions. The instructor’s modeling will open up ways for you to use these strategies with your students.